With the recent enjoyment I received from reading Cthulhu 2000, I have been on the look-out for other weird tale anthologies I might enjoy. 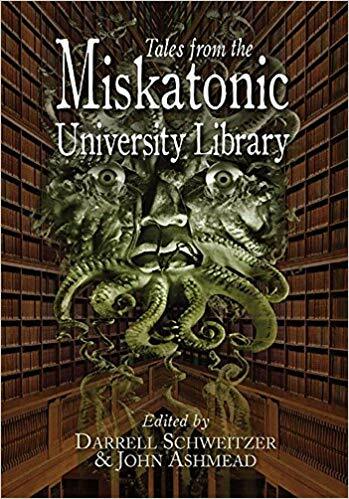 Recently, Tales from the Miskatonic University Library came to my attention, and it intrigued me for two reasons. One, being a bibliophile, I am attracted to books that have books as one of their central themes, but also, being a bibliophile, I was interested because the book comes from PS Publishing, an England-based, small-press publisher specializing in fantasy and science-fiction. Long story made short, I bought a copy. So, let’s take a closer look. The book is 6” wide by 8.5” tall, making it just slightly shorter than average hardback novels, and about the same dimensions as Cthulhu 2000. It comes with a dust jacket with appealing (if not ‘attractive’) cover artwork. 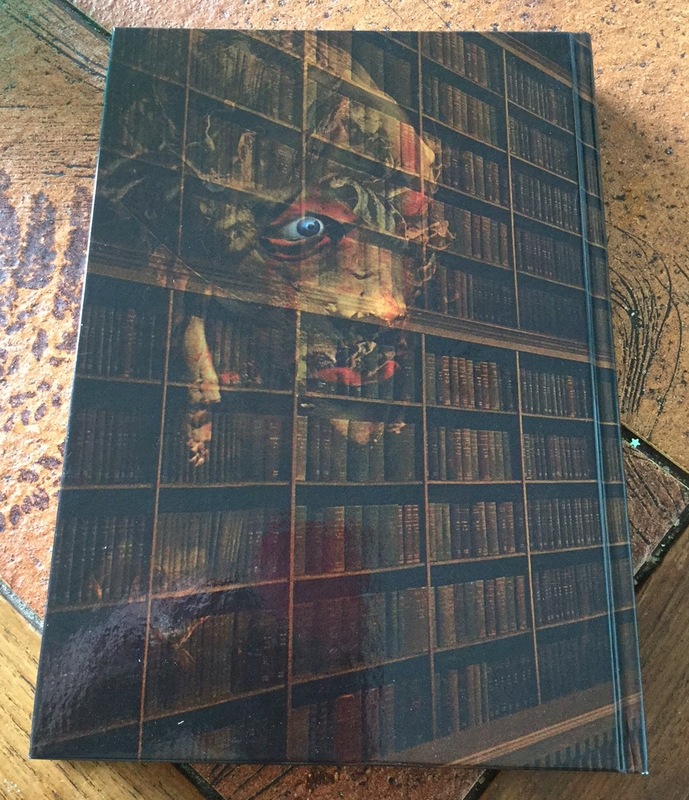 This artwork is repeated, without the text, on the front and back covers of the book, an interesting and slightly unusual choice. Normally I prefer cloth boards, but I like this. I even briefly considered ditching the dust jack, but this left a blank spine, which doesn’t look so great on the shelf. The paper is of a nice, high quality; the printing is excellent, and the text is extremely readable. The book was printed and bound in England (by T. J. International). This is somewhat unusual as British printers usually can’t compete with foreign printers, and probably speaks of a small print run. I was slightly disappointed the book did not have head and tail bands (these are the little bands on the top of the binding, inside the spine). It’s a minor point, but it’s a very easy, and not overly expensive, way for publishers to increase the quality feel of their books. Overall, I was very pleased with the look and feel of the book. At £20 for 200 pages, this seemed a reasonable price from a small-press publisher. Now, to the actual contents! The book features 13 short stories, from 13 different authors. One of these, Harry Turtledove, I would put as a ‘big name’. Of the remaining dozen, several are well-known within the weird-fiction/pulp/Lovecraftian subgenres. Of the tales, I probably enjoyed about half of them. I don’t generally care for humorous, or tongue-in-cheek weird tales, and this anthology includes several. These may be great stories for those who are into such things, I’m not really qualified to say. There were, however, a few tales that really stood out for me. The first of these, and the first in the book, is Slowly Ticking Time Bomb by Don Webb. This is a terrific little tale about a pair of used/rare book dealers, a lost city, and a very odd book of magic. It’s a really inventive story, and covers a lot of ground in its 14 pages. Although it’s a horrific tale, there is a really nice heart to the story. Definitely an author to keep an eye on. In the middle of the book comes Will Murray’s A Trillion Young. I’ve encountered Will Murray’s name many times before, but usually when writing about pulp heroes such as The Shadow or Doc Savage; this is the first time I’ve seen his Lovecraftian fiction. In truth, I didn’t expect to like the story, which opens up with the Necronomicon being digitized and released onto the web, but Murray drives it forward with such relentless energy that I couldn’t help but be pulled along. It’s basically an ‘outbreak’ story with weird tale trappings, but it is thoroughly enjoyable. Probably my favourite story in the whole collection comes in the second half with The White Door by Douglas Wynne. This is a relatively simple tale about a book that moves itself from library to library. I think the amazing thing about the story is the ending. Douglas shows off some real writing skill in presenting an ending that is as horrific as any imagined by Lovecraft, and yet manages to put just the tiniest glimmer of hope in there. It’s rather refreshing in a genre with its clichéd ‘but it wasn’t actually dead! endings’. While several others stories were enjoyable enough, those were the stand-out tales for me. In truth, I would have hoped to enjoy the whole book a tad more than I did, but, as I said, a chunk of the stories were not of the kind that would ever appeal to me. Others may find more to love. Combining the text with the book itself, however, I am impressed by the offering from PS Publishing. The book's quality was high, the editing was terrific, and it contained some really good writing. I would happily order other titles from them. I am a weak. For most of my life, I have operated a strict ‘no pre-order' policy. Although this means I sometimes end up paying a bit extra, and on rare occasions, miss-out, I think it has stood me in good stead. I have found, through long life experience, that I tend to enjoy an item less when I pre-order than I do if I purchase it when it is already available. My interests are extremely varied, and tend to flit from one thing to another very quickly. Thus, if I pre-order something I’m interesting in at the moment, it is possible, likely even, that I will be significantly less interested by the time it arrives. But…a few rare things are so close to my heart, that I am confident my interest will be high whenever they arrive. 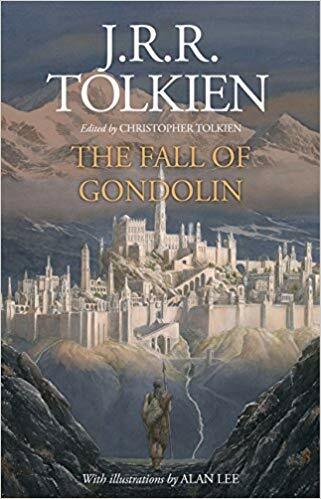 And thus, I have pre-ordered The Fall of Gondolin by J.R.R. Tolkien. Readers of this blog will long be familiar with my love of Middle-earth, so I don’t think it is worth elaborating upon. I do believe, though, that this book has a special place. I am pretty confident that it is the last time we will get a book, with a Middle-earth story, written by J.R.R. and edited by his son Christopher. And not just any story, but one of the true epics of Middle-earth. I have no doubt the Tolkien estate is going to continue to make money off Middle-earth after Christopher Tolkien is done (in fact, they already are with the sale of TV rights to Amazon), but I really doubt that anyone in the future will treat the original writings with the same respect, love, and devotion that Christopher has shown in a lifetime of editing his father’s work. So, in some ways, I think this is it. It is not something I want to miss, and I know it is going to be a book I want to sink into as soon as it is released. Also, I know I'm going to want it in hardback, and not just because of the gorgeous Alan Lee artwork on the dust-jacket! I am weak, but occasionally, just a little bit of weakness can be fun. Another miniature (or two) has fallen before my brush. This time it is the snakeman mercenary sculpted by Bobby Jackson to accompany the release of Ghost Archipelago: Lost Colossus. While I intended to paint this guy merely for use in random encounters and what-not, I am so pleased with him, he might have to join up with a crew for some adventuring. He certainly looks more like a great hero than a run-of-the-mill fighter. Whenever I’m working on a miniature, I like to keep a couple of extra little ‘bits’ on hand – scenery, or treasure tokens, or the like. This gives me something I can work on if I’m waiting for paint (or more often a wash) to dry on my main miniature. 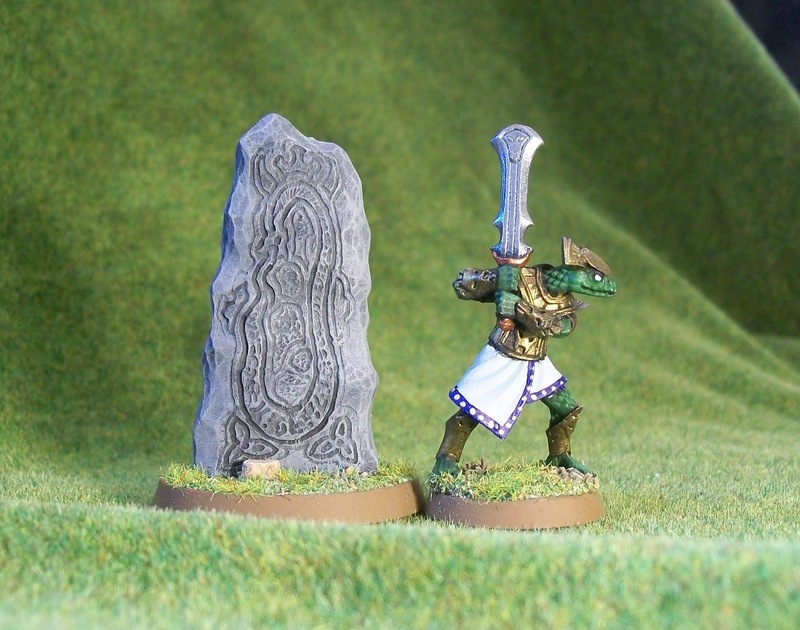 So, while I painted the snakeman, I also painted up this ‘runic stone’. This stone comes from the Frostgrave Ulterior Motives Red Herrings set. Something like it is necessary for use with Frostgrave: Ulterior Motives, but it is also the kind of thing I frequently include in scenarios as an objective of some sort. Even if it isn’t specifically needed for a scenario, it’s just adds a bit of visual interest to any tabletop. I based the stone for use in Ghost Archipelago because I have recently written some Ulterior Motives cards for use in the Lost Isles. These appeared in Spellcaster:Issue 3. 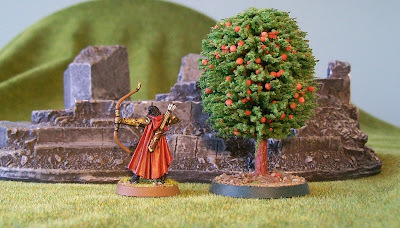 Even outside of the world of Frostgrave, I can see this stone getting use. It’ll look good on any Middle-earth or even Dark Age battlefield. Since my wife was out when I painted this, I had to keep one ear glued to the baby monitor and thus I was unable to listen to anything. This miniature has been languishing on my lead pile for nearly two years. It’s not that I don’t like it, quite the opposite in fact. It’s just that I never had a handle on how to paint it. 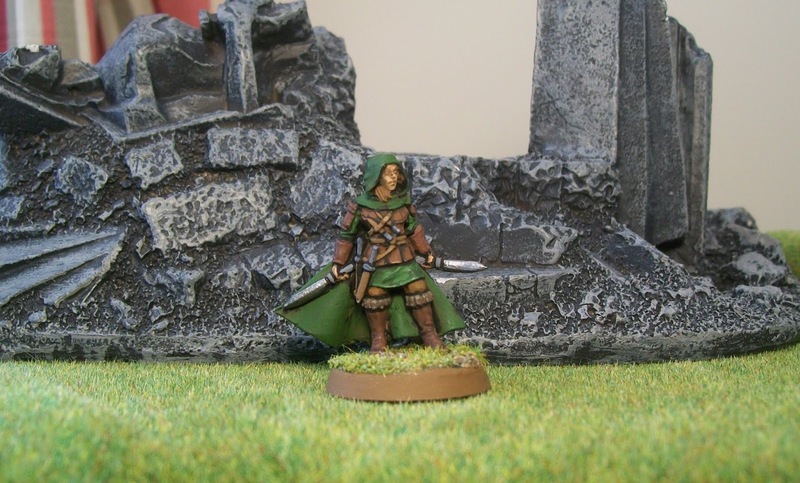 The figure is the Frostgrave assassin, and I think it is one of Giorgio Bassani’s best sculpts in the range. However, my thoughts about the figure have always been ‘coloured’ by the artwork upon which it is based. In the artwork, the woman is dressed all in grey (as makes sense for an assassin), but I just didn’t think I could pull that off. 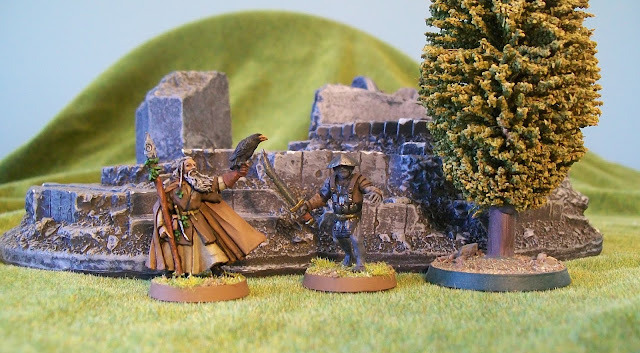 Recently, I was having a flip through the Lone Wolf Adventure Game by Cubicle 7 (based on the premiere series of fantasy adventure books of my childhood), and I noticed how closely some of the depictions of the Kia Lords in that book were to the figure. So, instead of grey, I painted the figure a combination of brown and green. As I’ve discovered many times in the past, it is often contrast in colours on a miniature that really makes it a success, and I think that is the case here. I painted this figure while listening to Blood of the Daleks Part 1 and Part 2. (It really is just one story). It’s an enjoyable Doctor Who adventure, if not ground breaking. The story kicks off a full season for Paul McGann’s eighth Doctor, and I am hoping to listen to the whole thing in time. Paul McGann is definitely one of my favourite doctors to listen to on audio. During a recent trip home, that mostly consisted of visiting friends and family and watching minor league baseball, I had time to go through some of my old books that are still lingering in my parent’s attic. 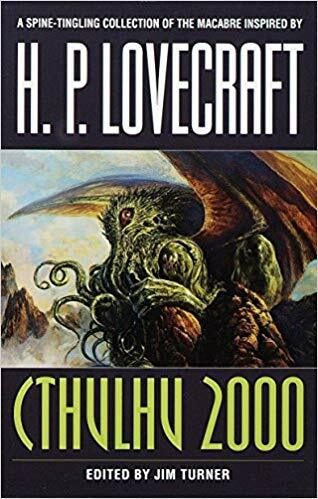 Among these half-forgotten tomes, I found one entitled Cthulhu 2000, which I don’t remember purchasing. It comes from Arkham House, that legendary publisher of the weird. In fact, I would rate the whole book as an above average collection of weird tales. Most are ‘Lovecraftian’ in one way or another, but not all of them. There are a few duds, as there always are, but a few real gems as well. More important than the stories themselves, was the effect the book had on me. For a while now I have been feeling the urge to write some fiction, and reading Cthulhu 2000 helped kick me into gear. Last week, I wrote my first fiction story in several years. Okay, it’s a piece of flash fiction that doesn’t even make it to 500 words, but that is of no matter. It is a complete story, and I am proud to have written it. Now I need to start looking for places to submit it so I can start collecting rejection letters again! Because that, more than anything else, is how you really know you are writer! 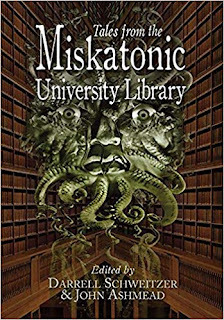 Anyway, although my copy of Cthulhu 2000 is an Arkham House hardback, I see the book is also available as a cheap paperback. I didn’t realize that Arkham House licensed their books out for paperback. Anyway, if you are in the mood for some weird fiction, it’s got some good reads. My adventure in Middle-earth continues, with the second episode of the 1981 BBC Radio adaptation of The Lord of the Rings. You can read about Episode One here. The second episode opens up with Gwaihir the Windlord arriving at Orthanc and rescuing Gandalf. I must admit, I found it a bit strange to hear one of the great eagles speak. Although Gwaihir certainly speaks to Gandalf in the book, I assumed that Gandalf could speak the language of the eagles, not that Gwaihir could speak in the tongues of men. The story continues to follow Gandalf for a bit as he’s dropped off in Rohan, meets Theoden and Grima Wormtongue and eventually rides off on Shadowfax. The story then cuts to the Black Riders arriving at Orthanac, and getting more or less dismissed by Saruman. However, soon thereafter, they intercept Grima on his way to Orthanc, and it is from Grima that they learn the approximate location of the Shire. The inclusion of this scene is really interesting, because it was written by Tolkien, but does not appear in the The Lord of the Rings. Instead, it can be found in the Unfinished Tales in a section about the Black Riders’ hunt for the ring. It probably shouldn’t be taken as cannon as Tolkien wrote several versions of the journey of the Black Riders (including one where they wipe out a village of the ‘river folk’). I can only assume it was included to give the Nazgul a little more ‘screen time’. Next we join Frodo, Sam, and Pippin on their way to Crickhollow. As one of my commenters mentioned after the last post, it is a bit hard to get used to Pippin with his rather ‘posh’ accent. Still, it makes him easy to identify in the group of hobbits, which might have been the point. In fact, we stay with the Hobbits for the rest of the episode as they meet with farmer Maggot, arrive at Crickhollow, and push on for Bree and the Prancing Pony. Although it’s all enjoyable stuff, purists will be saddened by the loss of Fatty Bolger, Gildor Inglorion, and Tom Bombadil, none of whom appear. This last omission is by far the greatest as it is such a wonderful part of the story. Also, without Tom, you don’t get the Barrow-downs, which really is one of the scariest parts of the entire book! It could have made a great episode all by itself. Still, I suppose there were time limitations and something had to go. One thing we do get, however, is several of the hobbit walking songs, and while none of the principle hobbit actors are great singers, I think this is part of the charm. At Bree we meet Strider. I have to say, I was a little disappointed when I first heard Strider speak. Played by the well-respected actor Robert Stephens…I don’t know, it just wasn’t quite working for me. However, at this point, I think Strider is putting on a bit of a ‘tough face’, definitely the ranger not the king. I’ll be interested to see if and how the performance changes throughout the series. High praise does go to James Grout as Butterbur. He just really nails this minor character. All-and-all, another enjoyable episodes with a few surprises. My tape for this one wasn’t quite as good as the first, and poor famer Maggot went a bit wobbly at one point, but nothing major. 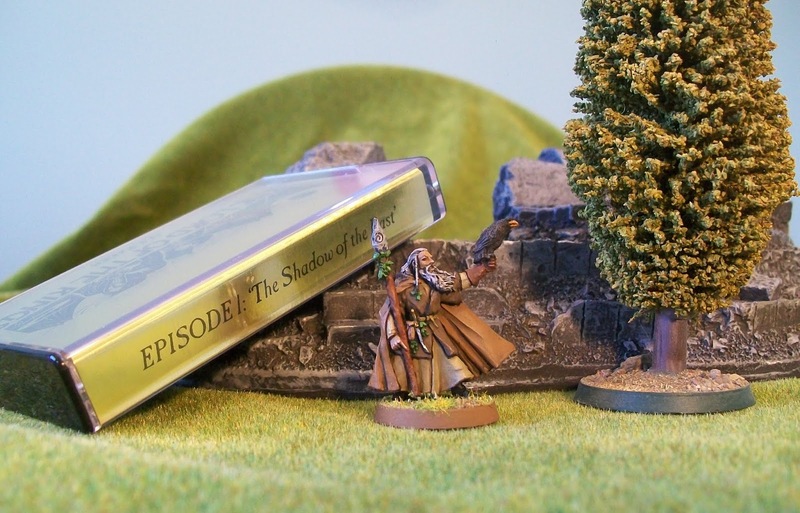 While listening to this episode, I painted up an armoured Haldir figure. Well, I painted him more as a generic high-elf warrior. I struggled with this figure. For my ability and eye-sight, the figure is almost too finely detailed, and initially, with a black undercoat (which I always use), it was hard to figure out what was what. I knuckled down though, and eventually got the figure to a place I was happy with. I think the decision to go with dark hair was definitely the right one as it helps contrast with all of the gold armour. Because this figure took me longer than normal to get right, I didn’t manage to finish up an orc to go with him. That’s fine, I’ve still got eleven episodes left. Plenty of time for orcs! I am probably one of the few fantasy fans on the planet that has neither watched Game of Thrones nor read any of A Song of Ice and Fire. I won’t go into the long-winded reasons why, but basically, by the time you are my age, you have a pretty good idea of the kind of stories you will like and which ones you won’t. 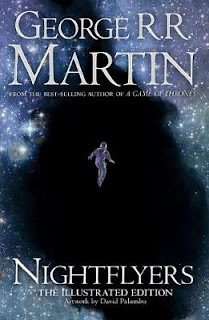 This doesn’t mean I am against everything Martin has written however, and when I saw Nightflyers on the shelf at the library, I was sufficiently curious to check it out. Nightflyers is a collection of six science-fiction stories, written by Martin in the seventies and very-early eighties. While these stories all take place in the same universe, they don’t overlap at all. Each one was clearly written to stand alone. The first thing that is noticeable on reading this book, is that even forty years ago, George R. R. Martin was a master word-smith. His prose even then was a smooth as anyone’s. Of the six stories, I would rate 5 of them as good or great. Nightflyers – is a classic 'horror in space' novella. Similar in tone and setting to the movie Alien, but a bit more complex. Really good if you are into such stories. Override – is more of a western, set on another planet, and following a guy who controls a small group of undead miners. Weekened in a War Zone – The only story in the collection that didn’t work for me. Just a bit too linear, obvious and repetitive for my liking. And Seven Times Never Kill A Man – What happens when religious fanatics go to war against a group of nearly pacifist aliens? This, apparently. I must admit, I had no idea where this story was headed, but it’s good, and the ending really bent my mind a bit. Nor the Man-Colored Fires of the Star Ring – A good story with a really neat setting. I saw the ending coming, and it was a tad disappointing, but I enjoyed the ride anyway. A Song For Lya – Another novella, this time concerned with telepaths, religion, and human interaction with an alien society. This one slowly builds and builds until the reader is presented with a big question about religion. It’s enough to make one uncomfortable, and thus really succeeds. All-and-all, it’s a very good collection of science-fiction with a couple of really strong stories in it. A few weeks ago, I bought a copy of the 1981 BBC Radio adaptation of The Lord of the Rings on 13 audio cassettes. A couple of weeks later, I bought a machine that could actually play audio cassettes. Last night, I finally sat down and listed to the first episode, The Shadows of the Past. The episodes opens with a quick bit of narrative about Sauron and the rings of power, and then, to my great surprise, begins the story proper with the capture and torture of Gollum in Mordor! The scene is well performed, and as such, makes slightly uncomfortable listening. The tone of this opening is a far cry from Tolkien’s own opening, which focuses on Hobbits and birthday parties! As an interesting side note, the agent of Mordor who captures and interrogates Gollum is never identified in the narrative, but is named as the Mouth of Sauron in the end credits. After this opening sequence, the story becomes more familiar. We hear the Gaffer talking with Ted Sandyman about the Baggins, Bilbo and Frodo discussing the coming party, and, soon enough, the arrival of Gandalf. By this point, the audio had fully sucked me in. The quality of the acting is excellent. Gandalf especially, played by the famous Shakespearean actor Michael Horden, really delivers. In fact, I am left wondering if Ian McKellen studied this performance before taking on the role himself, as his own delivery is remarkably similar (although McKellen perhaps plays him a bit more quick tempered). Ian Holm, as Frodo, sounds so young that he is nearly unrecognizable as the actor who played Bilbo in the movies. If you listen carefully though, you can definitely recognize the young Bill Nighy who plays Sam. I was glad to hear that the audio stuck to the chronology of the book, and after Bilbo leaves the Shire, seventeen years pass before the story really picks up again. Gandalf returns, identifies the ring, and immediately sets off again. The Gaffer informs us that Frodo and Sam have moved to Crickhollow, with help from his friends Merry and Pippin. Then, another slight surprise. We return to Gandalf and his encounter with Radagast the Brown. Wisely, the audio decides to follow the movements of Gandalf at this point instead of having them revealed after the fact, as in the book. It was nice to hear Radagast, and not have him sound like a bumbling fool. The episodes comes to a close with Gandalf’s trip to Orthanc and his betrayal by Saruman the White. It’s a great cliff hanger of an ending, but also provided my only real disappointment of the episode. Saruman has one truly defining characteristic in the books – his voice. It is said to be his most potent weapon. While Peter Howell turns in a fine performance as Saruman in the episode, he just doesn’t have a voice that reaches out and grabs you. Certainly, he doesn’t have Christopher Lee’s memorable voice. All-and-all, thoroughly enjoyable, and I’m definitely looking forward to episode 2! As I mentioned before, I am using the listening of this series as a chance and an excuse to paint some of my backlog of The Lord of the Rings figures. For the first episode, I selected the original Radagast figure (before I knew he would appear in the episode!). I love this figure. Thankfully, it was sculpted long before The Hobbit movies, and thus we get a noble and heroic-looking wizard. I decided to paint him more or less, ‘by the book’, which is to say, I used the same basic colour scheme on him that the painters at Games Workshop did. I think it was a good decision; he’s suitably ‘brown’, but there is enough contrast to make it visually interesting. Since it normally takes me about 2 hours to paint an miniature, and the audio episodes are only about an hour long, I had to continue on for a while after the tape stopped, but I was having fun, so I didn’t mind. I also decided that with each figure I paint, I’m also going to paint one orc. You can’t have too many orcs, but they aren’t that much fun to paint, at least not in the quick and dirty style I use (which is all they really deserve). This guy is constructed from a Wargames Factory body and head, but arms from the Frostgrave Gnoll kit. The word ‘obsolescent’ isn’t used very often these days. I occasionally encounter it when reading military history, usually in reference to a tank or plane that has been superseded by greatly superior models, but that’s about it. Essentially, obsolescent means ‘in the process of becoming obsolete’. Which is ironic, because it appears to me that the word obsolescent is itself obsolescent. I do wonder if this is because the word is just little known, and thus not often used, or if the cause lies deeper in Western society. Is our society such that nothing these days is obsolescent? Is everything either ‘modern’ or ‘obsolete’? Or, put another way, is the process of society’s adoption of a new, better technology (or idea?) now so fast, that the obsolescent step is skipped, and the given thing goes straight to obsolete? Anyway, all of that is really just a preamble for the fact that I purchased a Walkman. Okay, it’s not actually a Walkman, it’s a cheap knock-off (or at least it was 20-30 years ago when it was likely produced). I bought it for $10 during my recent trip to America. 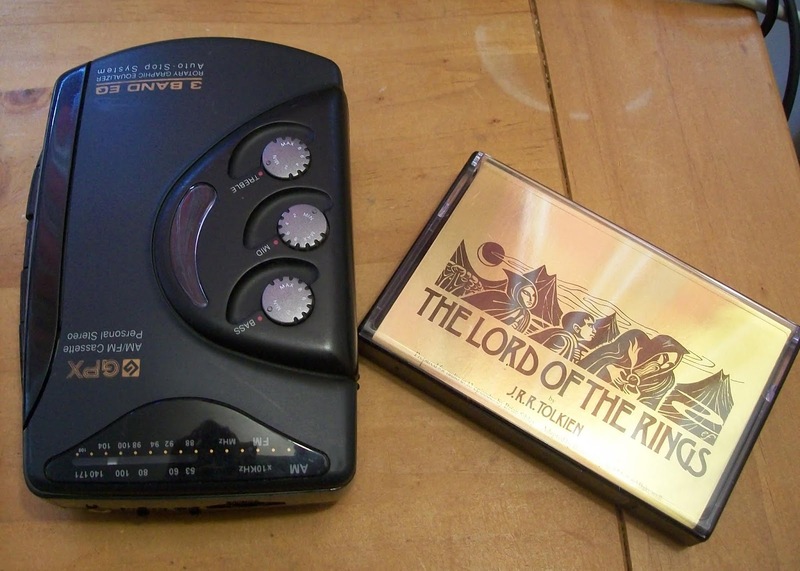 I only bought it so I can listen to The Lord of the Rings audio I bought a few weeks ago. I’ve had a quick test-listen, and there does seem to be a slight ‘wobble’ in the sound, but since I have no other way of checking, I don’t know if that wobble is because of the player, the tapes, or even the original recording. Oh well, I’m quite looking forward to trying it out. There are 13 episodes in the box set. 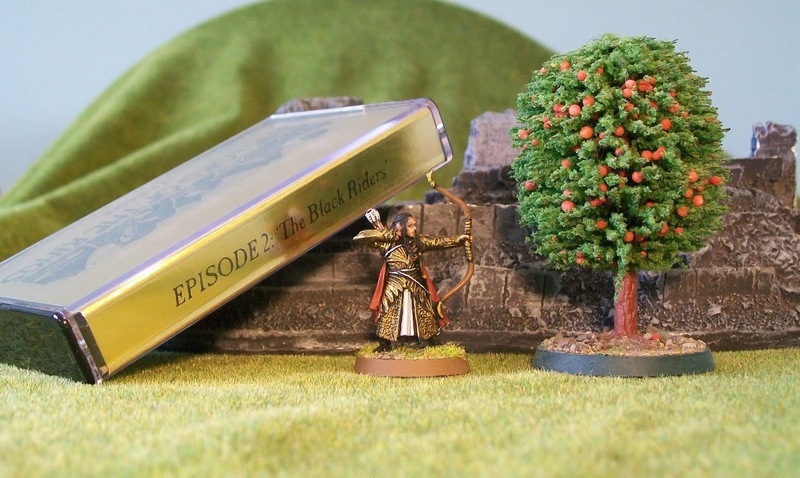 My plan is to listen to them one-at-a-time, painting a new The Lord of the Rings miniature with each episode and taking the time to blog about each one as I go. So something for readers to look forward to (or endure)!